Tula Bane and her family are on a colony ship headed to begin life on a new planet. When they stop at a space station, the leader of the colony ship beats Tula to within an inch of her life and leaves her for dead. Her family doesn’t realize and they leave on the colony ship, abandoning Tula on the remote space station. She is saved by an alien named Heckleck, who teaches her the way of things on the space station and helps her to survive. When three humans get stranded on the space station, Tula finds herself torn between her mistrust of humans and her desire for companionship. She sees the humans as her way off the space station, and perhaps a way to exact her revenge on Brother Blue. This book had such an original story. There were so many different types of aliens on the space station and we get to learn about a lot of their different customs. Tula is the only human on the station so she must learn the way of these aliens in order to survive. I really admired Tula’s will to survive–even though she is all alone, separate even from her own species, she never gives up and finds a way to make money and create a life for herself. Tula lives on the station for years and years without seeing another human, so when the three humans crash onto the station, she doesn’t even know how to act towards them. The relationships she developed with the humans were very strange, and the one quality I didn’t like about Tula is that she is extremely manipulative and uses people to get what she wants. She does this with the other humans, telling them what they need to hear in order to get from them what she wants. I understood that she needed to do this to survive, but it also made her slightly unlikable. Overall, Tin Star was a very original story about a girl who has to grow up fast and learn to survive. I’m interested to see how Tula’s story will continue. 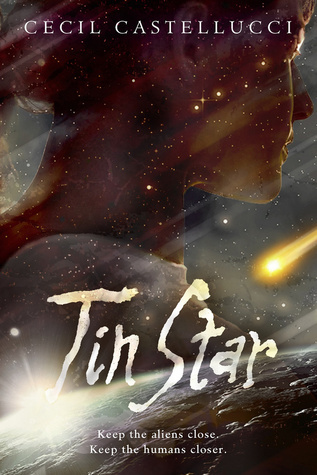 Tin Star will be released on February 25, 2014.